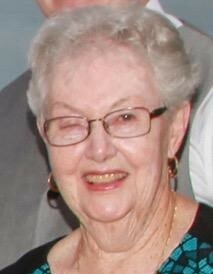 Kathleen “Kay” R. Bergeron died February 6, 2019 at Maine Medical Center after a brief illness. Kathleen was born July 29, 1926 in Dover, NH, the only child of Edward and Kathryn Flanagan. She attended local school and graduated from Dover High School in 1944. Following graduation, she worked at the Strafford National Bank. She married Rudolph Bergeron in 1950 and they moved to Biddeford in 1956. Together they ran teenaged dances and concerts at the Palace Ballroom, Whitehall and St. John’s Hall in Biddeford. They also owned and operated the White Cap Village Motel in Old Orchard Beach for 25 years, moving permanently to OOB in 1972. Kathleen was a communicant at St. Margaret’s Church. She was predeceased by her husband Rudolph in 2012. She is survived by her 2 sons Brian Bergeron and his wife Frances of Old Orchard Beach , and Stephen Bergeron and his wife Louise of Gray; five grandchildren; Christine, Matthew, Geoffrey, Daniel and Ethan, and three great-grandchildren Isaiah, Mara and Maeve. Friends and relatives may call at the Old Orchard Beach Funeral Home, 36 Portland Ave. Old Orchard Beach, Me., Monday from 9 to 10:45 AM. A funeral mass of Christian Burial will be held at 11am Monday at St Margaret’s Church. Burial will follow at Laurel Hill Cemetery, Deering Park where she will be laid to rest beside her husband Rudolph. Arrangements are under the direction of Old Orchard Beach Funeral Home. Memorial donations may be made in her memory Iris Center, 189 Park Avenue, Portland, Maine 04102.